Wow! Is it Monday already? I'm rather ok with it though since Dustin will be off of today and tomorrow. It's one nice thing about not having the traditional week, I don't get let down as much at the end of the weekend. Things are going better here. We are on the mend. Still not 100% better yet, but we'll get there eventually. The first card I made meets the challenge requirements for the current Everything But the Kitchen Sink challenge that a few of my gal pals host. 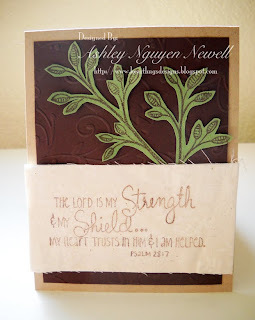 The challenge is to use fabric on your card. This fabric is the packaging from a handmade bar of soap that I bought. So, not only is it pretty, it smells really nice. I used the Devoted Ippity set for this card. There's no DP on this card. The background is Cuttlebugged. The branches are stamped on textured card stock and then cut out. I used Memento ink to stamp on the fabric and it worked out wonderfully. I did want the edges to look a little frayed so you could tell it's fabric and not paper. The second card I made is for VSN. The challenge was issued by my friend Carole. It was an inspiration challenge to be inspired by the colors of the Olympics sweater. I used my new Regal Greetings set for this card. The embelem is stamped in Versamark and the sentiment in brown. The DP here is My Mind's Eye, Lush. I love this paper with a passion! It's fabulous!! The ribbon is value ribbon fron Joann's. I actually used the opposite side of the ribbon since I didn't want too many patterns on this card. You can see a little of it on the inside of the bow but I think it's subtle enough. I also used a pearl sewing pin on the bow for some added glam. Have a happy week everyone! :) Don't forget to check out the Ippity blog for a list of everyone who participated in the hop today! Love 'em both! Love the texture and colors on the EBKS and the colors and that big red bow on the VSN! Beautiful! Glad you are feeling better! Both the cards are so pretty. What a creative idea to use the fabric from the homemade soap. Love that bow and colors of the second one. ooooh love that brown/red one.. stunning.. wow! Your cards are fabulous. I really like the second one with that big red ribbon and bow! Hey ya cutie cutie! LOVE the cuteness of these cards, but I LOVE the 2nd one with the classy feel with the fabulous ribbon treatment! Very nice cards. You're very creative. Great job. Beautiful cards Ashley! Stunning! Have a great day! both are great cards, but I am really digging the one with the big red bow!! WOW!! I love the red with the brown~very cute! Awesome Ippity creations, Ash! I recognize that brown DP too-some REALLY sweet chick I know scored me some when I couldn't get away to check out the goodies at CHA ;) heehee Thanks! love your colour choices.. the second one is just a stunner.. that paper and that red bow.. WOWSERS!! Lovely! I'm still loving that big, read bow! Great ippity card, too!! Glad you guys are starting to feel better. Beautiful cards! That red ribbon is beautiful! These are SO pretty, Ashley!! Fantastic colors and design! I love how you reused the packaging from a bar of soap. So resourceful!